“Character episodes” have fallen out of favor with me unless they’re done right. At least, for a story-based series with a limited number of episodes. For Aria, the focus is on the characters, and there’s a high enough episode account. Things can still be done wrong, but this episode went in the right direction. This episode didn’t invent something for Alice to overcome, then have be forgotten for the rest of the series. It’s not like Nanacchi’s effort to learn to cook in Seven of Seven, where Nanacchi’s cooking skills aren’t really addressed otherwise. No, for Alice, this is a confrontation with everything the viewer has learned about her up to this point. 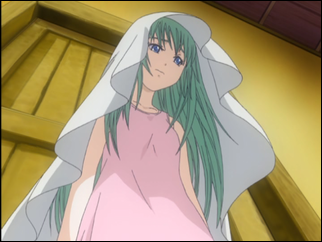 Actually, this episode of Aria the Natural is a lot more like Cocoloo’s self-exploratory episode in Petite Princess Yucie. Unfortunately, Cocoloo’s experience didn’t have too much of an impact on her as far as the rest of the series went. It was essentially a forgotten event. Will this happen with Alice, as well? Will she return to the way she’s been, no questions asked? Or will she try to be more open, fail at it, and then return to her old ways? Or will she be a more open person, but mostly still reflect the personality she’s known for around Akari and Aika? Please, please, please, do not let this episode’s events be forgotten during the rest of the series, or there was no reason to have this episode! However Alice acts in the next episode, it will be a reflection of how the company party went, and a reflection of how Alice allowed things to go. She can’t have Athena or Akari or Aika with her there, so she’s completely on her own. Aside from the characters of the episode, some production-related things stood out to me. First, Spring is almost over already? After all that time I kept asking, “Is winter over now?”, finally Alicia and Akari “find Spring”, and now Spring is almost over? Already? Wait, what just happened here? There must be a reason for it, but could they seriously not fit anything into Spring? Were they rushing to get to a Summer event, requiring they skip over six Manhome months? They girls can’t be Singles and a Pair forever. This simply cuts down on the amount of time they have available before their promotions take place. 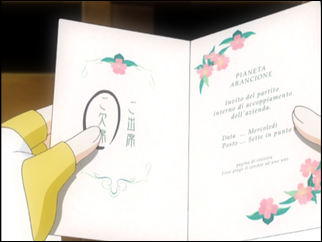 The invitation Alice received uses both Japanese and Italian. Considering Alice has an English name, Akari has a Japanese name, and Akari uses a computer with desktop software in English, I’m still convinced that English is the world-language of Aqua, and potentially Manhome. Using Italian in Neo-Venezia makes sense, even though Akari doesn’t seem to have a strong handle on the language (probably due to little exposure and no use). Orange Planet, on the other hand, might have knowing Italian as a requirement, and Alice might be taking an Italian-language course in school. In my view, the letter did use Italian. The reason for Orange Company to use Italian is to get a fancy, “authentic” Venetian feel. However, it didn’t use Japanese. It used English, as that is what I’ve determined Neo-Venezia’s common language to be. The choice for Japanese on the card thus becomes an animator’s method of letting the viewer know what’s written on the card. The Italian part is read out to the viewer (allowing it to keep that “special” feel of being Italian), and the RSVP part is written in a language the viewer can easily read and know. Akari’s prior visit had her wear an Orange Planet uniform, but that’s not a problem this time because the girls have “permission” to be there. Something still seems off to me about having Akari wear that uniform in the previous episode. Actually, a greater observation is that everyone keeps wearing their Undine uniform, even to dinner. Unless they have more practice ahead that night, or expect to take customers out, is there a reason not to change into their civilian clothes? Certainly it would be better to accidentally drop/spill some food or a drink on ones casual clothing than to allow it to happen to ones work uniform. The only times Alice and Athena are not seen in work uniform are related to taking a bath (yukata worn afterwards) and when sleeping (pajamas). 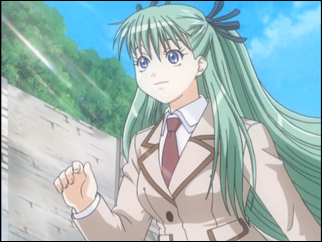 Of course, Alice also wears her school uniform to school. I realize it’s probably a minor thing to wonder why the girls wear their Undine outfit as much as they do, but seeing their choice of clothing really does add to the character, to who they are. I’ve noticed from time to time that Alice’s hair has different styles, although I haven’t kept track of the number of styles. (For all I know, it could be only two styles.) 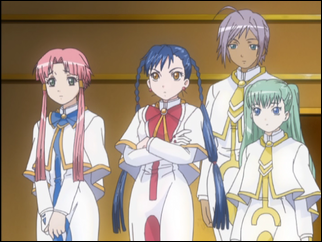 None of the other characters are shown with differing hairstyles. I note it now because Alice looked strange to me most of the episode, and I thought maybe they had a less experienced animator on this episode, until I realized she simply looked different, due to her hairstyle. 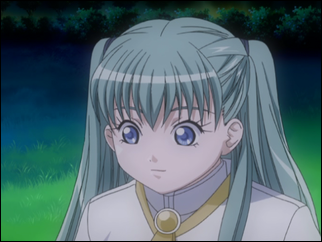 Early on in Aria, I thought Alice might have potential as a favorite character, but I never connected with her in a favorite character manner. Akari has her Expert of Wonderful thing going, which earns her that spot for me. This episode did go far to help me connect with Alice, however, as she and I have a lot in common. I’m typically not one to make polite conversation for no reason. Because of this, it’s difficult to talk with someone I have nothing in common with. What’s there to talk about? Small talk doesn’t suit me, and it doesn’t suit Alice, either. Being surrounded by two people she can talk with thus is a far greater thing for Alice than being surrounded by two hundred people she has nothing to talk about with. Of course, it helps if she gives them a chance a little. Final thought: Was that ceiling fan done using a computer with 3D modelling? It looked to be, and stood out too much for my liking. It jarred me from enjoying a 2D episode with a 3D-style item taking center stage.